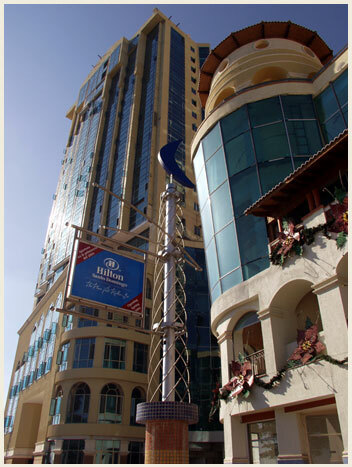 An impressive 22-story tower is home to a 5 star hotel with 228 rooms, suites and junior suites, operating under the Hilton International franchise. This chain is known to own one of the highest quality standards in the hotel business. Even though the hotel is part of the Malecon Center complex, it still remains independent in terms of access as well as in the handling of activities carried out within. The central part of the building has a multiple height that integrates the upper levels, visually as in terms of space. These levels are connected by stairwells and see-through elevators offering an amazing opportunity to appreciate the Caribbean Sea caressing the southern coast of the city of Santo Domingo. A modern and splendorous casino becomes one of the hotels main attractions, with direct access by elevators and escalators.